Picnics remind me of the times when we used to go together with family and cousins. Most of the times it was on a hired van to Murree, the mountain resort in the outskirts of Islamabad. The snow on the mountains, the walk on sloping roads, the horse ride and chairlifts, the jam packed places with travellers and the hot tea… the place used to be the most popular resort. It was the company we enjoyed most, from singing on the way, to riddles, jokes and taking pictures, it used to be memorable treat. Pir sohawa was one the closest place to go out with friends. On a cloudy and rainy day, we often planned a quick picnic and used to drive to Pir Sohawa and have lunch at Monal. The view of Margalla Hills and Islamabad, used to give a pleasant fresh change. A cup of tea with friends and a beautiful sight was all we needed from time to time. A place I much yearned, yet could not visit was Northern areas of Pakistan, the Kaghan Naran Valley called the land of fairies, or Swat called mini Switzerland of Pakistan. It had beautiful snow mountains, lush greenery and beautiful blue lakes. The wet and cold weather at more than 3000 feet gave it contrasting comparison with the surroundings. A view of lake saif al Malook, an absolute beauty amidst valley and polo match in Chitral used to be most popular with international tourists. Being abroad in England has fulfilled my desire to be amidst nature. With beautiful sights of Scotland and Wales at a few hours drive. Europe luckily is also very close by. This time we decided to have a road trip. To see France and Switzerland. Our journey started with a few hours drive to Port of Dover, where we decided to stay over night and take the ferry in the morning to Calais. Our hotel was very close to the port. Upon arrival I made coffee for me and my husband, grabbed a ginger biscuit and started to look outside my window. It was later on in the evening. The sea stretched in front of me with all its mighty blue power and roaring waves. Big colourful stones on the shore made it a captivating sight. The fresh air of sea side, chirping and wailing of seagulls created an over whelming abode. People were sitting outside the restaurants and hotels, having great food, laughing and enjoying the sight. It was a full holiday mode, I could feel the sensation, the drive and the excitement of holiday in their voices. This place had been an inspiration for many creative minds. From Winston Churchill the most famous resident of Kent, to Shakespeare and Charles Dickens, the stunning blue beaches had compelling stories to inspire. Visiting for business or leisure this gateway had so much to offer with famous white cliffs, the castles, historic places, heritage, top restaurants and local farmer markets. After a very long day, we preferred to have some sea food and go to sleep early. Street lights, the light house and their reflection in moving water was yet another pleasing sight to absorb before I managed to close my eyes. I woke up with noises of two young girls outside. It was very early in the morning. Darkness still entrapped the brightness of the day, trying hard to let go it’s might. I put my glasses on to have a close look. A girl stood in front of the ocean, proclaiming that no one loves her, not the parents nor the family, that she didn’t want to live any more. She was shouting at the top of her voice, taking out all the grudge, anger and resentment on nature… as she felt a complete failure and could not face it anymore… It is no surprise, that nature fails to offer a medicinal benefit to mentally perturbed and unhappy souls. This is where it needs a helping hand. Her friend, tried to talk to her in heightened emotions to turn back and stay safe. She reminded her of how precious she was as a friend and she could not stand to lose her. With some persuasion, love and care she finally managed to bring her back to the benches. In my childhood we played a game called blind man’s buff.. a child was blind folded and made to get hold of others by the sound, sensation and voices…others tried to dodge, often calling out and running away. Sometimes, the friends out of kindness warned if there was an approaching wall or pointed big stone on the way in order to prevent the friend from disaster and getting hurt. Perhaps growing old is a game changer after all, in the game of success and disappointments, we all need the company of good friends to believe and guide us. Sometimes, when failures blindfold we see through the eyes of our friends. With an optimistic insight on the first day, it was a good beginning. An early start to the day and we decided to have the breakfast in the ferry. 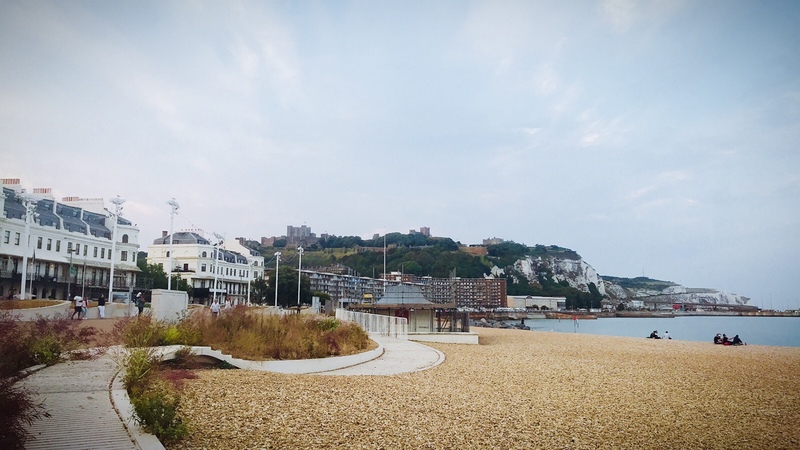 We drove to park the car inside the ferry and climbed the stairs to have a breakfast and enjoy tea on the terrace, with white cliffs behind and Calais in front. One hour passed by in a glimpse. After moving the watches an hour ahead we went to our parked cars to make our way out in Calais France.